We all know that Christmas is a time of giving. A time when we remember the greatest gift ever given, the gift of Jesus in flesh. The gift of salvation brought to life. We give gifts because we've already received the greatest gift ever to be given. We give gifts to everyone in our lives, kids, parents, teachers, postal workers, but is it wrong to give a gift to yourself? I don't think so. So often we as mothers give give and give some more that sometimes it's nice and actually IMPORTANT to give a little to ourselves. Maybe your gift to yourself this year will be laying off the mommy guilt. Maybe you'll give yourself permission to fail, to not be the "perfect" wife, mom, etc because we all know that person doesn't exist. Maybe you'll give yourself 10 extra minutes of peace and quiet by setting the alarm. Maybe you're going to give yourself energy by exercising a little more regularly. Maybe you're going to give yourself time by setting a timer for "extra" things like tv shows or computer time so you don't get sucked ALL the way in, but then you'll have the time to do the things you want and need to do. Maybe you'll give yourself time to craft things for YOU! I plan on doing ALL of these things. Maybe your gift to yourself will be more a material object. Those are nice too. My husband and I do the St. Nicholas thing with our kids (but not Santa) since he was a real man who gave to the poor and needy. But who fills my stocking...me! So, this year I didn't give myself anything. But that's becuse I didn't have any small gift that I really wanted...and I am still working on gifts for others so I haven't gotten around to my own crafting yet...but I will. 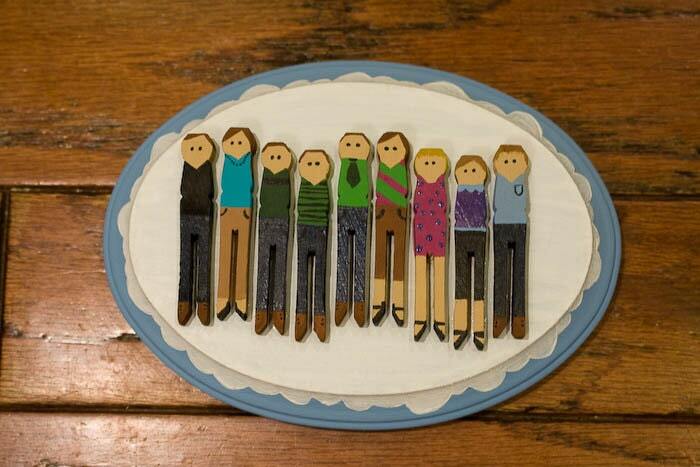 I will make myself some pajama pants and I will make myself a clothespin people wall hanging. What are you going to give to yourself? If you're still looking for the perfect gift some someone on your list come on over to my etsy store and see what I've got that might help you check off another name!